The right tools for toddlers. When you start out adult life, either married or single, you want cool kitchen gadgets. Even if you don't cook, or never use them, it seems like a good idea to have these fun, pricey items. I've got a mixer, blender, smoothie maker, ice cream maker, old school popcorn pan, bread maker and food processor to name a few. And it doesn't have to be a big machine. Maybe it's the cool rabbit ear wine bottle opener (I do love that thing), a funky martini shaker (am I an alcoholic? ), a cool garlic press or a fun pie server. Things like these are not necessary, yet fun to own! When you have kids, and they are of the toddler and/or preschool ages, these fun gadgets are no longer necessary. You need two things. Just two. Do you know what they are? 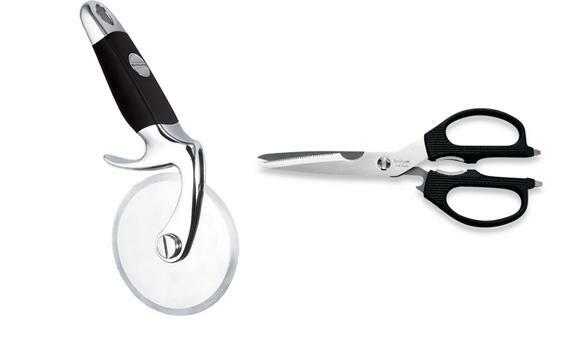 A pizza cutter and a decent pair of kitchen scissors. That's right. Just those two. You can cut any toddler/preschooler cuisine rapidly without burning yourself using these items. This is important when they are screaming and whining for food. You have to be able to serve it fast. And they have to be able to eat without choking. You can probably get by with only the pizza cutter, but the scissors are a nice option for some things. My recommendations? So, when your kids reach the toddler and/or preschool age, box up your fun gadgets for awhile. They'll just be pulled out of the drawer and played with by your children, and then they'll be coated in drool and dog hair. Sick. All you need is a decent pair of kitchen scissors and a pizza cutter. For real. Moms-to-be should include these on their baby registries.